Rieder, David. Suasive Iterations: Rhetoric, Writing, Physical Computing. Parlor Press, 2017. 188pp. ISBN 1602355681. The main reason I have resisted reading on screens is that my spatial sense of the page and of the book get lost as I read PDFs or eBooks on a computer monitor or a tablet. Using such technologies, I have little sense of where I am in the book in terms of page length, and I don’t have the same kind of spatial memory of the page I have as I do when interacting with a print object. When seeking out a passage that I have previously marked, I will often think something like: “I know it was about a third of the way through the book, on the left page, about halfway down.” I’ll flip through the book looking for the passage that I’ve underlined or for a check mark in the margin. This extremely unscientific and ultimately print-centric mode of marking up and consulting a text is no doubt tied to a lifetime of engaging with books, but it has been difficult to shake, and I haven’t yet found a comparable set of habits for electronic reading. David Rieder’s Suasive Iterations: Rhetoric, Writing, Physical Computing provides me with an interesting way of thinking about this problem, because my reading practice is, like any reading practice, gestural. Rieder’s book asks us to consider our interactions with devices like the Microsoft Kinect or Arduino-driven DIY projects as rhetorical—as allegorical experiences that make us think differently about objects, physical spaces, and how we interact with them. My own ruminations on the gestures of reading and marking up a print object (the acts of turning pages, underlining, flipping back-and-forth) can all be thought of as an allegory for print-based reading, which relies on the sequential arrangement of letters and invites a certain set of practices. My interaction with the book tells a story about how one can engage the book, and while my own practices are idiosyncratic, a closer look at my gestures of reading might expose an opportunity to think differently about engagements with print. Rieder calls for a new approach to rhetoric in the “post-PC” era. For Rieder, the PC era relied on a model of “centripetal computing” that focused our attention and activity on a single device and also established “the distinction between the virtual and the real”: “The cliché of the PC user surfing vast spaces in a virtual world while slumped over a keyboard and mouse is indicative of the extent to which the era interpellated its users to a computational world distinct and disconnected from the everyday” (6). A move away from or beyond the desktop inaugurates what Rieder calls a more “centrifugal” model of computing that “virtualizes our everyday experiences and expectations, but…does not ask us to disavow the world around us; rather it integrates the virtual into it.” If the PC era is defined by our focused attention on a desktop computer, then the post-PC era is exemplified by our immersion in an environment shaped by a range of computational devices. Not only are such devices constantly sensing information about the environment, they are also taking the power of a desktop computer off the desk and into everyday life. For Rieder, this requires that we reimagine what digital rhetoric is and that we remember that our PC-era theoretical tools may not be the best fit. Our centripetal approach “blinds us to the dozen or more sensors and cloud-based processes with which… ‘personal’ devices constantly communicate at the periphery of our attention” (8). By drawing our attention to this periphery Rieder wants to make the invisible visible. Rieder develops a set of theories that work against the assumption that a good interface is one that “disappears.” Through tinkering, we can interact with, remake, and reinvent interfaces rather than allowing them to fade into the background. In fact, Rieder even argues that the history of computing and the history of rhetoric share this troubled relationship to disappearance. Instead of “calm” computing devices that fade into the background, Rieder encourages (by way of Richard Lanham’s discussions of attention, style, and digital technology) that we focus on devices that grab attention. The idea here is not to emulate style as “brevity and clarity” but instead to invent devices that show themselves (86). If stealth rhetorical strategy can manipulate, so can the invisible interface, meaning that rhetoricians are in a good place to consider how to theorize the making and critique of computational devices that are creeping into all parts of everyday life. For Rieder, transduction is one of the four key technologies of the Post-PC era. It is joined also by sensors (which sense physical energy), actuators (which exert some kind of physical force in the world), and internet-based communications. These four technologies allow for the creation of computing devices that sense information (sound, movement, light, etc. ), transduce that information into some other form of energy, generate movement or action, and potentially connect to the Internet to either receive or send information. While all four of these are important to Rieder’s argument, transduction is the key rhetorical tool amongst them, since it is where a rhetor makes decisions about how to convert energy toward suasive ends, and those decisions are decidedly in the realm of the material and the concrete. By tinkering with materials such as Arduinos and accelerometers, one can think of rhetoric as Levi-Strauss’ “science of the concrete,” an approach to invention that is directly engaged with the senses rather than modern science’s penchant for operating “at a remove from nature” (39). In order to theorize this rhetorical science of the concrete, Rieder casuistically stretches a number of theories and theorists from the rhetorical tradition. Rieder draws upon theorists just as he does sensors and actuators, piecing together theoretical circuits. Components and wires are replaced with concepts from Nietzsche and Lanham, and he constructs intricate rhetorical mechanisms that help us approach the creation and critique of physical computing devices. These theories are then coupled with a discussion of practice and invention, and here is where Suasive Iterations takes an extra step. Each chapter is followed by a “half-chapter” that demonstrates the inventional processes Rieder theorizes in the main body chapters of the book. Each demonstration describes an original physical computing project in detail, and each is offered as a heuristic for invention. Rieder encourages readers to use these projects as relays for their own work with physical computing, and he builds “dashboards” for each project that offer visualizations of the data one can access with various sensors. For instance, the dashboard in chapter 2.5 provides a visual representation of data sensed by accelerometers, small sensors that measures three-dimensional movement. As one moves the accelerometers, the values in the dashboard change as do line graphs that represent shifting values. Rieder makes clear that the dashboards he creates are just one approach to visualizing what a particular sensor can measure and represent, and they offer the reader a starting point for building dashboards and projects of their own. The range of these projects is impressive, and they include a project that explores the bureaucratic depths of a tweet, a use of the Microsoft Kinect to help reintroduce the body into the field’s discussion of delivery, and a discussion of how conductive paint or copper tape might open up new discussions of the physical gestures we associate with computing devices. Rieder’s “distant writing” is influenced by Franco Moretti’s “distant reading” and “break[s] from the logocentric proximity of writing to speech” (22). In this formulation, writing encompasses a broad range of inscriptive practices. Here is the clearest moment at which Suasive Iterations is a resource not only for those who study digital writing. The book invites all theorists of rhetoric and writing to rethink our processes and objects of study by way of transduction. Drawing on the work of Tim Ingold and others, Rieder “pr[ies] apart the presumed relationship between alphabetic writing and speech,” allowing for the inclusion of physical computing (as well as a range of other line-making practices) to become writing rather than something that supplements or complements what we have traditionally understood as writing. This expansion does not leave behind the alphabet or meaning but rather opens up the study of writing to a range of practices. Alphabetic writing is but one way that writing can transduce. It was Rieder’s discussion of the extra-representational potentials of writing that led to the physical computing project that accompanies this review. Thinking of writing beyond the hermeneutic drive pushed me to rethink reading along the same lines: How might we understand reading beyond interpretation and representation? What happens if we imagine reading as a set of physical gestures that, while concerned with the content of a text, are never exhausted by the interpretation of that content? In order to explore these questions, I began to think about my own reading practices, which involve my memories of the page as a physical space marked up by my pen. My own reading process tracks important moments in the text spatially, and it understands the book as having certain “hot spots” or moments of intense interest. This metaphor of heat led me to an Adafruit tutorial for creating a thermal camera. Using an Arduino Uno microcontroller, a thermal sensor, a small LCD display, breadboards, wire, a soldering iron, a “helping hands” soldering aid, and a short snippet of code, I was able to prototype a device that would generate a kind of “heatmap” that tracks places where a reader has taken notes or underlined text. While the simple prototype I built does not “record” an entire reading of the text, such a device is entirely possible with different equipment and slightly more complex code. This more complicated version of the device would allow us to play back a reading of a text (indexing certain “hot spots” to specific page numbers). ‘Heatmap’: a reading of Suasive Iterations. The device I have prototyped tells you nothing about what is on the page, and nothing about the content of the book at any given moment. But it does allegorize a reading process (not the reading process, since different bodies will always engage a text differently), and if it were used to “record” a reading of the book, it would offer us insight into particular intensities. Those moments of intensity would be different for different people, so each reading would be virtuosic, and each recording would be singular. However, after collecting a number of these encounters with the book (and it’s key here to say book and not text), we might be able to draw some broader conclusions about its hot spots, moments when many a reader has paused to underline, highlight, or use some other gesture while reading. Further, it could turn the reading of a text into a performance, and one could imagine recording a set of such performances and installing the visualizations in a gallery or public space. This allegorization of reading demonstrates the importance of medium to a textual encounter, and it tells us something about individual and collective reading practices. I should note here that while building this project I did not follow Rieder’s method of tracing the various affordances of a sensor. In the book, Rieder painstakingly catalogs the affordances of a sensor, stepping through its specifications and brainstorming a range of potential projects. My own method worked in the opposite direction. I began with the gestures of underlining, marking up a text, and storing a visual memory for later and then went searching for sensors and actuators that might help me allegorize this set of gestures. I eventually found the Adafruit project for a thermal camera. In this project, I immediately saw the potential to track intense moments of reading—the device would sit above the book, a kind of recording device that tracks the reader, and it would record moments of engagement with a book. When one makes some gesture under the thermal sensor, we see a flurry of activity. This is a simple prototype, but it is an attempt to imagine what a more complex device might look like. Further, the more involved features that I have described here only emerged for me once I built this simple prototype. This is key to Rieder’s argument: the act of building physical computing projects is inventional, and as we engage with these various materials new ideas and arguments present themselves. Upon starting this review of Suasive Iterations, I knew I would need to make something. Perhaps, I thought, “making” a review with words (which is, to be clear, still a project of transduction) would be enough, but I was fairly certain I was going to be prompted into some other kind of engagement as well, something that took advantage of the affordances of physical computing. It was in the process of reading the book—a beautifully designed artifact in its own right, with color-coded tabs and high resolution images—that I began thinking of my own idiosyncratic reading process and how their ties to print might be allegorized using physical computing. I have been tinkering with physical computing devices since 2012, and I have been fortunate enough to have colleagues such as Kevin Brock and Steven LeMieux to help me figure out where to get started with such work. However, I am by no means an expert, and my programming and design skills are limited. I say this in order to encourage the reader who is intimidated by digital writing projects that involve soldering irons and sensor specification sheets. One of the great values of Suasive Iterations is that it is accessible to a range of audiences, something I have experienced first-hand. I was fortunate enough to read drafts of this book before it was published, and Rieder even allowed me and some colleagues to teach portions of it prior to publication. I co-taught a kinetic sculpture course with Elizabeth Demaray at Rutgers University-Camden during which we used portions of Suasive Iterations. That course was comprised of students from a range of disciplines. Very few of those students had programming experience, and none had any experience with physical computing. Students created impressive works of kinetic sculpture that engaged a range of topics, from the reading and interpretation of poetry to gun violence. I also joined Steph Ceraso and Casey Boyle in teaching sections of the book during our 2017 Rhetoric Society of America’s Summer Institute seminar on “Digital Rhetoric Behind and Beyond the Screen.” Again, very few people in the seminar had experience with these technologies, but they created projects that represented complex engagements with the affordances of physical computing. 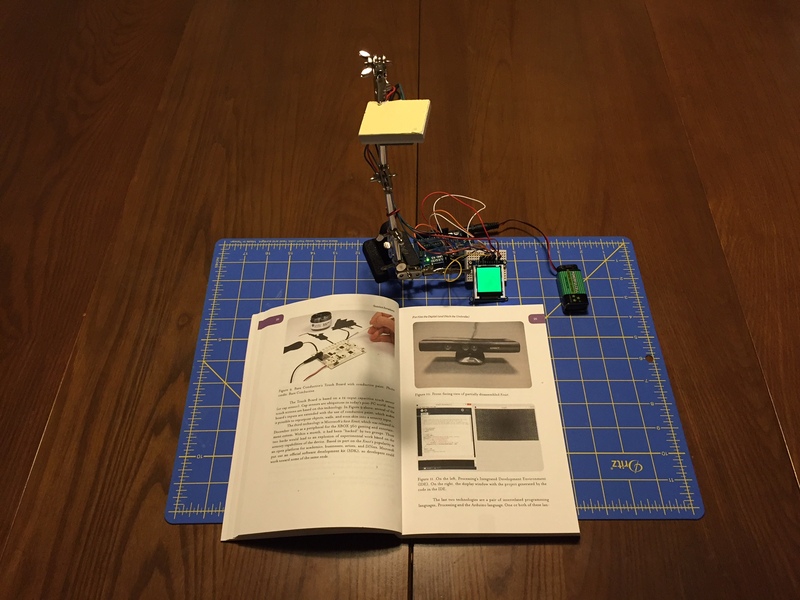 The book’s theoretical arguments and its methodical approach to invention mean that it offers rich resources for getting students to think about how to build compelling physical computing projects. James J. Brown, Jr. is Associate Professor of English and Director of the Digital Studies Center at Rutgers University-Camden. He is author of Ethical Programs: Hospitality and the Rhetorics of Software (University of Michigan Press, 2015).